Every time I think about this particular day on the Camino, I break out into a big grin. Had Muriel and I been driven, mileage-obsessed pilgrims, we would have missed so much delight, so much serendipity. After a lovely conversation with our host during the car ride back to Hornillos, she dropped us back on the Camino and we began to walk. The scenery in the meseta is more colorful than you might imagine from all the dusty tan images you see. In spring, the expansive fields have a bright stubble of green and poplars cluster along streams and damp shallows. Everyone thinks of the meseta as being pancake flat, but it isn’t. Seen from the air, it’s dotted with flat-topped hills called mesas (which means table in Spanish). In this terrain, the path ascends and descends all day, but no more than 300ft/100m or so. Because of this relative flatness and the absence of forest, the path is usually visible far ahead. Except today there was a delightful exception. Today, I really got to know Muriel better and enjoyed her company immensely. Her sense of humor cracked me up. We talked about books and authors we like. We also shared some of our life questions and the journeys we’d been on in our work, our relationships, in life. At one point, I shared with her the concept that everyone is no more than six degrees removed from anyone else. The Kevin Bacon theory. Now, Muriel is a smart woman. Her profession gives her access to tons of information. And I did not miss the quizzical, skeptical glance she gave me as I shared this idea. The conversation that followed was so funny and delightful — as the idea began to click, we started connecting ourselves to international political figures, celebrities, and authors. I loved that Muriel discovered the fun in this game. As we continued walking in the days that followed, we added on yet more people. We only think we’re separate, but we’re really all connected. After a while, we paused along the path near San Bol for a snack and said hello to passing pilgrims. We debated staying at its famous albergue without electricity. But the day was still young and we continued to walk in the warm sun. Later on, after having walked only about 11km/6.8 miles, the flat meseta revealed a charming little town tucked away in a tiny valley. We never saw it coming. And in the same moment, Muriel and I were enchanted by the view. We gasped. Before entering the village, we passed a tiny hermitage to Saint Bridget — who was both a Celtic goddess and a Catholic saint. It seemed like a good omen. The overall effect of this town on me told me that we were done walking for the day. Muriel agreed. Hontanas was too cute to pass up. After checking into an albergue and reserving a spot there for dinner, we went back up to the hermitage to explore. We ate cakes and drank café con leche. It felt like a mini vacation. Coming out of our second café, we met Meg who was in the middle of her lunch. We were delighted to see her again and had a nice conversation. It’s such a joy to re-encounter people you like on the Camino. Sometimes you don’t see them for days and when you do, there are hugs and greetings and conversations about the journey. So many times I felt the happiness of meeting up with new, old friends. 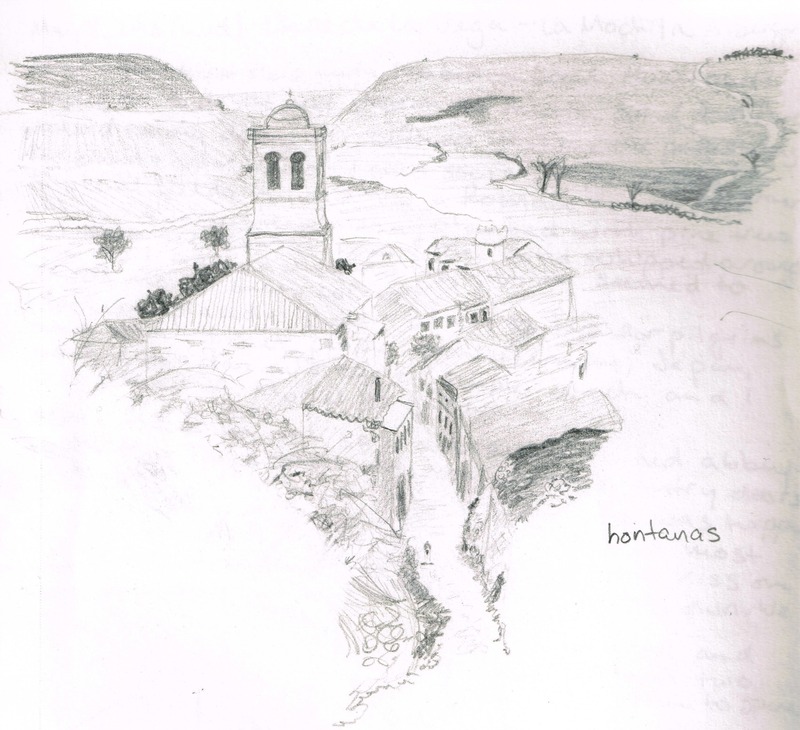 Later in the day, I went back up the hill to the entrance of the town and sketched the scene of Hontanas and the mills beyond. Tomorrow I would walk them. As I drew, I greeted pilgrims arriving, grinning at their exclamations, “Oh, here it is!” I think Hontanas is the meseta‘s best kept secret. It surprises everyone. In the evening, dinner was exceptional in that it was the first meal in which I couldn’t participate in the conversation. Besides Muriel and me, one man spoke a little English and the rest were German and Austrian. They were fun and rowdy and there was a lot of laughter which was contagious. The man who spoke some English translated for us saying that they were teasing each other about their regional accents with uproarious effect. Although I had a sobering realization that as many days remained to reach Santiago as there were stages in the book (Yipes! I can’t walk that fast! ), this day on the Camino made me feel so happy that I chose to allow myself so much time to walk. Had I been on a tighter schedule, I might not have had Muriel’s company, or stayed in Hontanas, or enjoyed myself so very much.